Life as Pink Einstein | Dallas Fashion and Lifestyle Blogger: Shopping OOTD- Collab with Sarah Elise! Shopping OOTD- Collab with Sarah Elise! So my friends Sarah, McCray and I all went shopping on Tuesday so before we went to the mall Sarah and I did a little photo shoot. 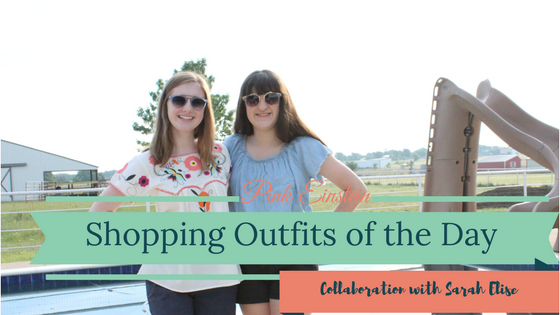 This is a collaboration with Sarah Elise and you can click here to read about her outfit! Any modeling agencies looking for some models?? Embroidery is very popular right now and I am in love with this trend! I love how bright the colors are and I like how light and cool the top is. I purchased this top from a local boutique. For shorts I wore these 5" navy blue shorts from Old Navy. I went with a darker color for my shorts so the colors in the top would really pop. And of course, I am wearing my platinum Jack Rogers. Thank you so much for reading and make sure to check out Sarah's outfit post here.